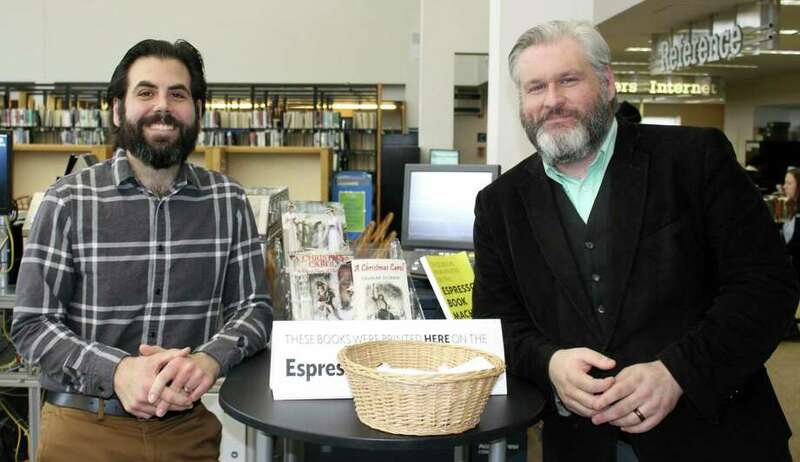 Westport librarians Alex Giannini and Cody Daigle-Orians at Westport Library, Jan. 16, 2018. Giannini and Daigle-Orians are some of the lead organizers of the inaugural Saugatuck StoryFest that will take place in Westport from Oct. 12 to 14. WESTPORT — Connecticut’s only literary festival is coming to Westport in the form of an experiential celebration of young adult and genre fiction such as horror, science fiction and romance. “In this first year, we’re celebrating the stories that help people fall in love with reading, which is generally YA (young adult) and children’s (books), but also genre too. That’s how you connect to a love of reading and stories,” said Cody Daigle-Orians, the Westport Library programming and events specialist and one of the festival’s organizers. “We have this core of writers who are shaping YA at the moment who will be here, which is awesome,” said Alex Giannini, the library’s manager of experiential learning and also a festival organizer. National Book Award nominee and recent Newbery Honor recipient Jason Reynolds, who Daigle-Orians called “the most important name in YA right now,” will give a keynote address on Jesup Green on Oct. 13. The three-day festival will kick off Oct. 12 with a keynote by former president of HBO Documentary Films Shelia Nevins, followed by a concert at Toquet Hall with composer and lyricist Joe Iconis. On Saturday, the festival will permeate downtown Westport with events geared toward children and literary enthusiasts. “Even if there were other literary festivals (in Connecticut), I think what we’re doing is unusual within the world of a literary festival. So much of what we’re crafting over the weekend is really interactive and experiential,” Daigle-Orians said. Participants will have the opportunity to fight with foam weapons on Jesup Green in a re-enactment battle activity inspired by the “Game of Thrones” books and led by the Norwalk chapter of the Dagorhir Battle Games Association. A diverse lineup of comic book writers will aid festivalgoers in creating their own comics. At the home-decor store Simon and Pearce, a panel of romance writers will speak and facilitate romantics in writing their own mini love stories on typewriters. For adults, several authors will speak at the Westoberfest beer garden put on by the Westport Downtown Merchants Association. “Apart from being a really great experience for people who are interested in coming to a literary festival and encountering authors, there’s a really strong educational backbone to what’s going on over the course of the weekend, and that’s in large part due to the schools’ participation,” Daigle-Orians said. The festival is made possible by a partnership between the Westport Library and the Westport Public Schools. The idea of a literary festival had been in their minds for a while, Daigle-Orians and Giannini said, adding Staples High School English teachers Rebecca Marsick and Kim Herzog also shared their dream. When the Westport schools’ Innovation Fund put out a call for grant applications, the group submitted its idea and received $25,000 in funding. StoryFest has also received donations from other residents. Festival organizers created a teen board of students from Westport, Bridgeport and Fairfield schools to help brainstorm and implement festival plans. On Sunday, the festival will transform into a writers’ conference at Staples High School during which this year’s Connecticut Book Award winners will be announced. “The goal is to unite everyone through story. It’s not just a Westport event. We’re bringing together Fairfield County and beyond around story, because everyone has a story to tell,” Herzog said.